Up at the crack of 9? Taking a casual morning, sipping coffee, drying a sleeping bag that was placed next to an open tent entrance last night (ooops! ), sipping more coffee and saying “see ya later” to Tony the Kiwi who is off toward Ljubljana. No hurries today. We’re crossing Pohorje on gravel roads, but cheating the first 1100 meters of elevation by taking the gondola to the top of Pohorje Ski Mountain and it doesn’t start running until 10. Nervous about getting the loaded bikes into the gondola, I insist that we arrive about 9:30 to survey the situation. C is used to this. She takes it in stride. The Gravity Bike crowd is milling around, smoking, waiting for the gondola. We try to blend in. At the top. Bikes unloaded. Triple checking the maps and Galileo. We pedal westward. 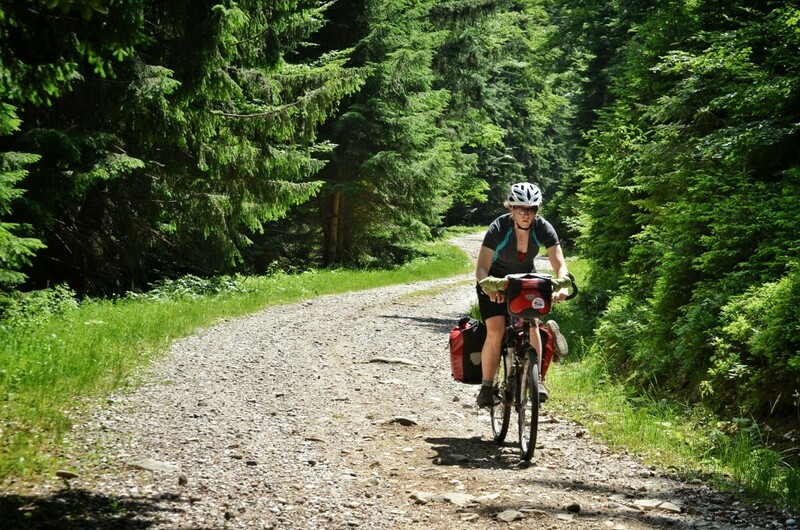 The first 75km on the Pohorje Tranzversal trail follows the ridge line of the Pohorje Massif. A densely wooded limestone mountain range bordered by Maribor, Dravograd and Slovenj Gradec. In and out of each drainage along the way, the Pohorje Tranzversal is surprisingly well-marked, eliminating the need for a map for most of the time. 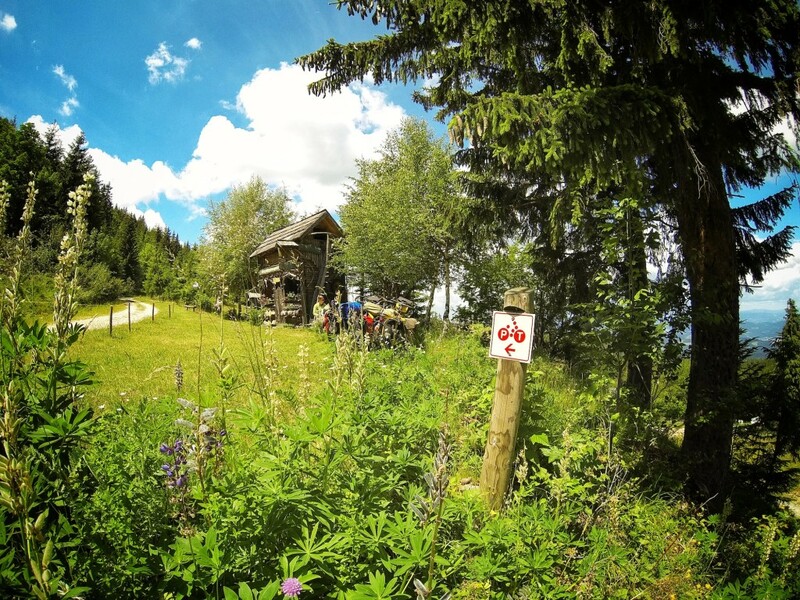 Along the way we stop in to see Šumik Cottage and spend the night at Pesek Cottage on Mt. Rogla. Sweet gushing spring water and mountain hiker’s cottages are common sights in this area. We take full advantage of both. 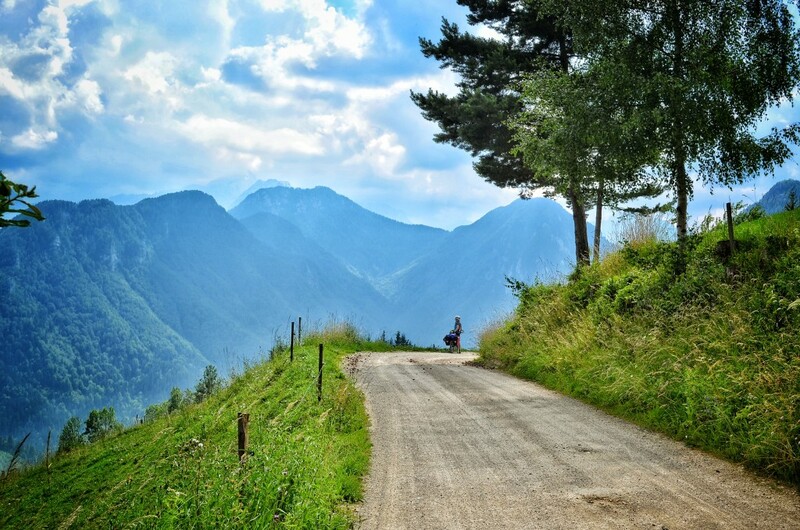 From Slovenj Gradec, C has plotted a route thru the hills to Črna na Koroškem and into Logarska Valley. It takes us 2 more days. We cover about 30km per day. We climb slowly and the route is hilly. I mean HILLY. Extended gravel grades tipping up into the teens. 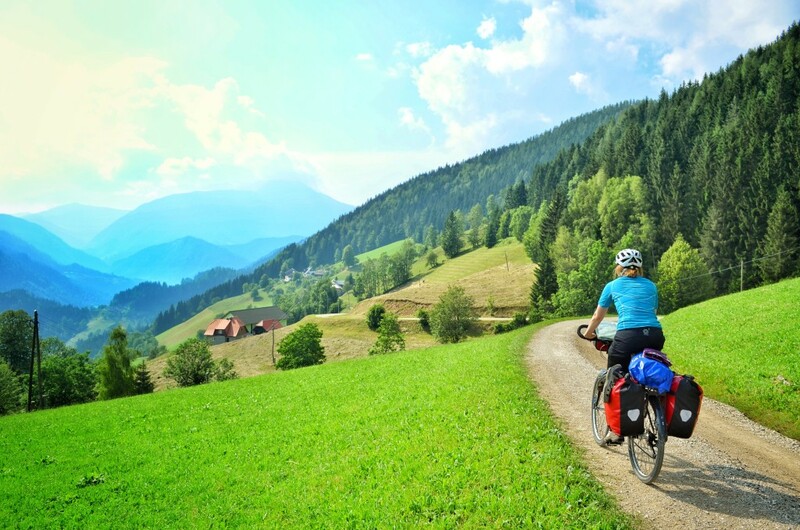 Complete with screaming twisting descents, bucolic hilltop farm views and friendly locals. Other than the locals who are busy raking hay, we are all alone. Although we are on “official” roads in this section, we are passed by no more than 4-5 cars over the two days, and we encountered only one other group of bike tourists. 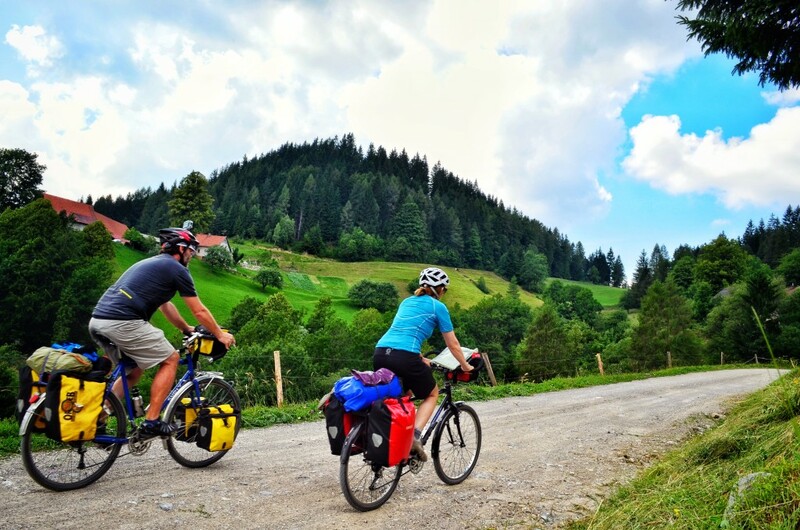 Winding our way down the gravel farm roads from Črna into Solčava, with mouths open and wide grins we can hardly contain our excitement. The transition from densely forested woodland hills into unsheathed Alps is truly breathtaking. It happens all at once. We came around a sharp corner and there they were sitting across the valley from us. Like limestone shark’s teeth, jutting skyward. Here in along the crystal clear Savinja River we will rest for the next two days. They make Blueberry brandy here. The first locals we meet offers us a sip. And then another. Tourist Farms abound here. 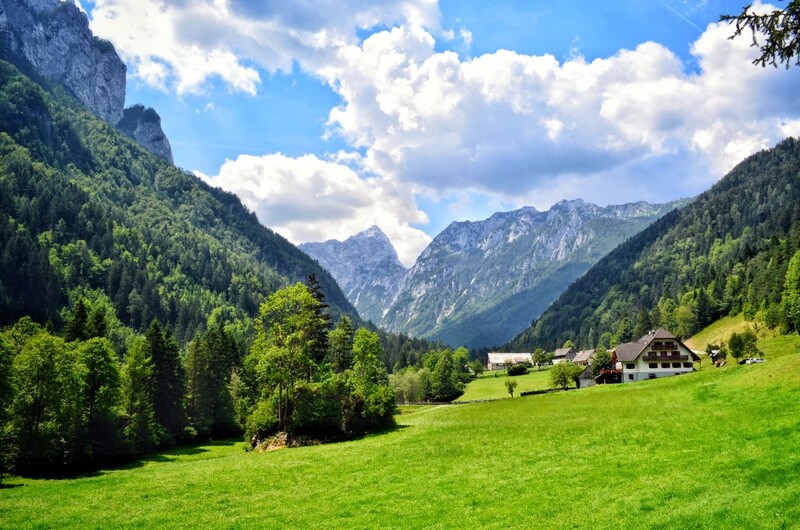 Working family farms in low Alpine Valleys, some more than 200 years old, provide lodging, home-grown food, and warm smiling faces. We stay at the Govc Family Farm. We like it here. The Locals have found a way to preserve their local farming culture by creating tourism surrounding their history and way of life. Not the other way around. 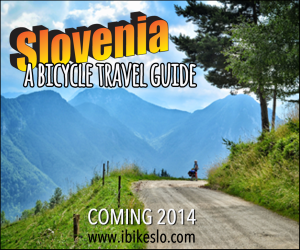 This is typical of our experience in Slovenia. Build on what you have..
It’s so nice to be here, we almost never want to leave. hey Tyler, regarding your article on climbing with a loaded touring bike, one comment: reward yourself with a treat at a milestone. 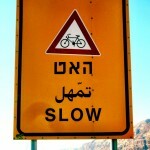 When climbing a long hill, I treat myself with a snack of nuts in say another five minutes or six more switchbacks etc. This makes you stop and relax for a minute or so and is good so that you keep the energy up. Also stopping for photos is good practice to have. I know some people have difficulty restarting on a hill, but not me. This snack treat works for me.